...Scale Down, Windsor: The Case For Fare-Free Transit. I realize that this isn't a Windsor-centric article - and I appoligise for that. We really do like to focus on all things Windsor, but if this idea spreads, we will honestly see Windsor's quality of life take a BIG turn for the better. I am still going to publish it, however, because it is an idea that Transit Windsor General Manager Penny Williams REALLY needs to know about. So here it is - a direct reprint from that wonderful e-zine The Tyee. Enjoy and spread the word. Why do we have any barriers to using buses, trolleys, SkyTrain? The threat of global warming is no longer in doubt. The hue and cry of the traffic jammed driver grows louder every commute. Yet since 2000, TransLink has hiked fares 50 per cent, and its board has just agreed to follow the staff’s recommendation to raise them higher still. That kind of thinking is so last century. Just ask the mayor of San Francisco, a city similar in size to Vancouver, who ordered his staff to seriously explore the cost efficiency of no longer charging people to ride public transit. Listen to Michael Bloomberg, mayor of New York, who recently voiced to a reporter his top dream: "I would have mass transit be given away for nothing and charge an awful lot for bringing an automobile into the city." 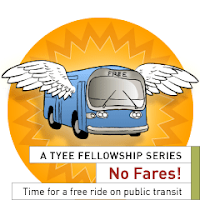 Consider this sampling of communities providing free rides on trolleys, buses, trams, and ferries: Staten Island, NY; Chapel Hill, North Carolina; Vail, Colorado; Logan and Cache Valley, Utah; Clemson, South Carolina; Commerce, California; Châteauroux, Vitré, and Compiègne, France; Hasselt, Belgium; Lubben, Germany; Mariehamn, Finland; Nova Gorica, Slovenia; Türi, Estonia; Övertorneå, Sweden. Read the rest of this article, and the subsequent 4 parts at The Tyee. Posted by Chris Holt at 7:05 a.m. I actually made this pitch to Halberstadt a couple of months ago and, while he agreed in principle, he did not think that anyone on the transit board would take the idea seriously. Does anyone know if public delegations can present ideas to the transit board, or is it a closed meeting? September 19, 2007 at 12:26 a.m.
Hmm -- MSN is becoming a little more progressive lately. Look at this article about the negative effects of parking lots on urban, and I assume sub-urban, landscapes. September 19, 2007 at 1:49 a.m. I am assuming that the transit board is a lot like PAC. You just need to show up at the meeting to speak on agenda topics. You don't need to register as a delegate like regular council meetings. Whether or not you can speak on items unrelated to items posted on the agenda - I highly doubt. You just need to get this item on the agenda, so it's time to start schmoozing the board. Looking at the councillors on the board however, I wouldn't hold my breath. September 19, 2007 at 7:41 a.m. Meetings are held on the second Wednesday of each month at Transit Centre, 3700 North Service Road East (at Central) in the boardroom, starting at approximately 3:30 p.m.
September 19, 2007 at 7:48 a.m.